This stunning book is full of amazing crochet projects, proving that crochet is far more than granny squares and afghans! When taken into the ‘fine art’ category, there are a few crochet designers who elevate this craft to an art – a fine art. 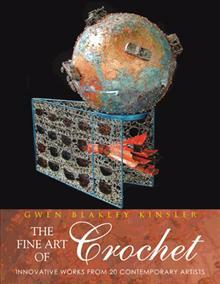 Gwen Blakley Kinsler is both a crochet artist and the author who has gathered an array of fine art into this enticing book. Twenty contemporary crochet artist are featured in this book. Using ‘string’ as fine as gold wire and as humble as plastic shopping bags, they demonstrate creativity and diversity in museum quality pieces. Along with the ‘string’, many of the designs include other materials like wood, findings of heavy metal, river rock, and enamel butterflies. From the magic of freeform to the discipline of tapestry crochet, there is art both representational and purely imaginative. In addition to the twenty crochet artist whose work is featured in this book, Gwen is herself a wonderful crochet artist. 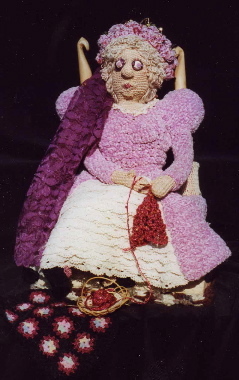 This is an example of her work and is one of my favorites, Crochet Queen: A Self Portrait, which one a CGOA award in 1995. While you might not recognize the name of every artist featured in this book, you will certainly understand why their work was included. Each is a masterpiece of creativity and some are pure artistry using repurposed materials. From the influence of Irish Crochet seen in a necklace/collar piece to the whimsy of a plastic ‘garden’ to portrait work, there is much to love about this book! Thank you, J. D. for that great review of my book! Thanks for sharing this, jd. Def. something for the Wish List.